Having trouble finding the right tenant? 1. The rent’s too high for the neighborhood. Above all, tenants are price-conscious, and online ads and apartment hunting services make it easy for renters to compare similar properties in the area. Do a little more research and see if the competition is driving down the rent, or if you misjudged the market. Ask prospective renters who do call what other properties they are considering and compare. 2. The ad is too vague to attract good tenants. Cryptic listings make it so hard to picture the property that it may never make a prospect’s list. Sell the property’s good qualities and get tenants excited to see it. Include photos and a floor plan so prospects can visual themselves in the unit. 3. The curb appeal makes prospects turn and run. Make an objective assessment of the property — the first impression. A little time and money spent on the exterior can make a big difference when it comes to a tenant wanting to call this property home. 4. The location is off the beaten path. The property may have obvious appeal and be near good amenities, but prospects simply can’t find it. If the property is on a quiet street — a big plus — consider placing a “for rent” sign on busier streets nearby. 5. It’s the wrong time of year. Are you limiting your pool of qualified prospects because you are trying to rent at an “off” time? If so, consider a shorter-term, interim lease that places your vacancy on a more popular rotation. 6. Trying to target the “right” tenants. An ad that tries to describe the ideal tenant — like pushing for professionals or workers at a specific nearby business — may be discouraging other prospects from applying. Instead, go with popular trends, like implementing and advertising a nonsmoking property, or consider allowing pets in order to open up the potential tenant pool. 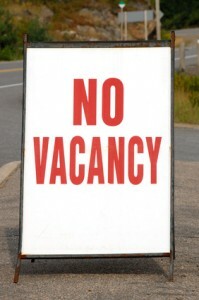 Regardless of the issue you face filling a vacancy, never settle for an unqualified tenant. Problem tenants seek out properties that have been on the market for a while, increasing the chances of future property damage, eviction, or other income loss — and that’s likely to cost more than a continued vacancy.